Kelly RJ, Hill A, Arnold LM, et al. 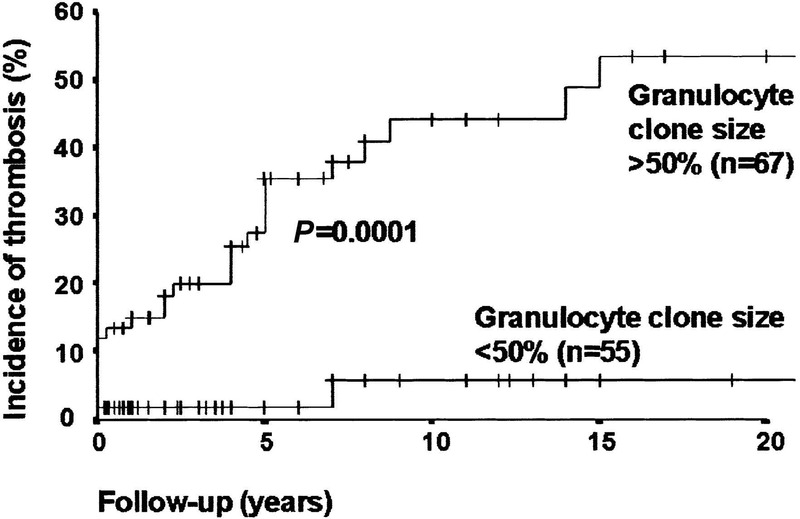 Long-term treatment with eculizumab in paroxysmal nocturnal hemoglobinuria: sustained efficacy and improved survival. Blood. 2011; 117: 6786-92. Luzzatto L, Gianfaldoni G, Notaro R. Management of paroxysmal nocturnal haemoglobinuria: a personal view. Br J Haematol. 2011; 153: 709-20. Brodsky RA. How I treat paroxysmal nocturnal hemoglobinuria. Blood. 2009; 113: 6522-7. Emadi A, Brodsky RA. 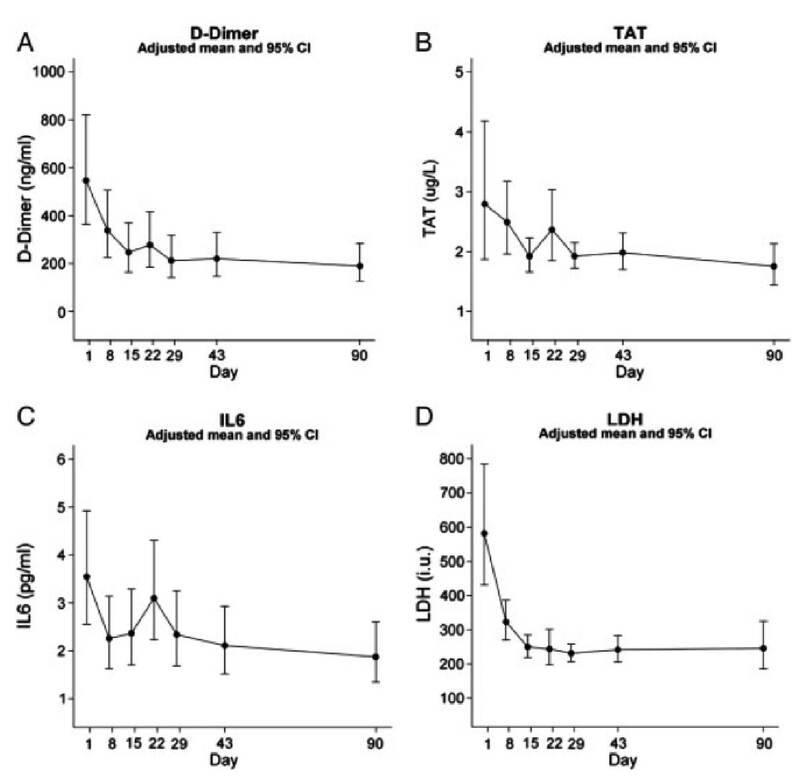 Successful discontinuation of anticoagulation following eculizumab administration in paroxysmal nocturnal hemoglobinuria. Am J Hematol. 2009; 84: 699-701. Hillmen P, Muus P, Dührsen U, et al. Effect of the complement inhibitor eculizumab on thromboembolism in patients with paroxysmal nocturnal hemoglobinuria. Blood. 2007; 110: 4123-8. Helley D, de Latour RP, Porcher R, et al. Evaluation of hemostasis and endothelial function in patients with paroxysmal nocturnal hemoglobinuria receiving eculizumab. Haematologica. 2010; 95: 574-81. 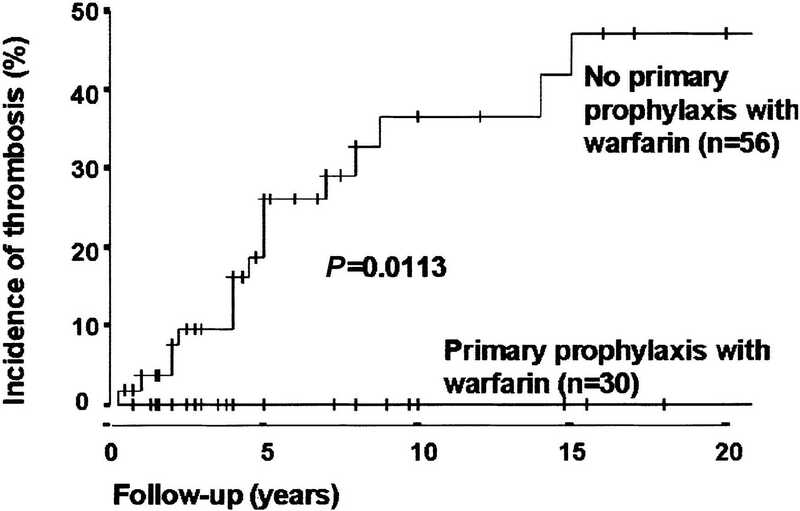 Hall C, Richards S, Hillmen P: Primary prophylaxis with warfarin prevents thrombosis in paroxysmal nocturnal hemoglobinuria (PNH). Blood. 2003; 102: 3587-91. Van Bijnen ST, Van Heerde WL, Muus P, et al. Mechanisms and clinical implications of thrombosis in paroxysmal nocturnal hemoglobinuria. J Thromb Haemost. 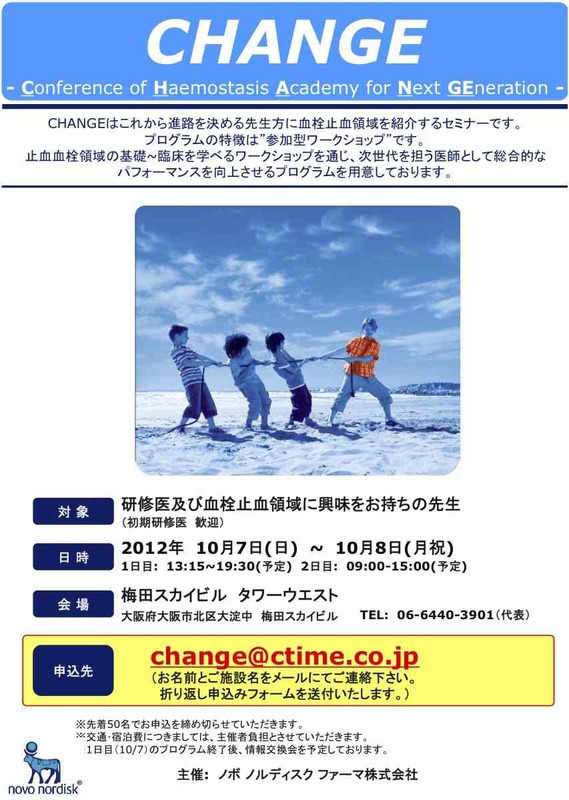 2012; 10: 1-10. Ploug M, Plesner T, Rønne E, et al. The receptor for urokinase-type plasminogen activator is deficient on peripheral blood leukocytes in patients with paroxysmal nocturnal hemoglobinuria. Blood. 1992; 79: 1447-55. Sloand EM, Pfannes L, Scheinberg P, et al. Increased soluble urokinase plasminogen activator receptor (suPAR) is associated with thrombosis and inhibition of plasmin generation in paroxysmal nocturnal hemoglobinuria (PNH) patients. Exp Hematol. 2008; 36: 1616-24. Hugel B, Socié G, Vu T, Toti F, et al. Elevated levels of circulating procoagulant microparticles in patients with paroxysmal nocturnal hemoglobinuria and aplastic anemia. Blood. 1999; 93: 3451-6. Wiedmer T, Hall SE, Ortel TL, et al. Complement-induced vesiculation and exposure of membrane prothrombinase sites in platelets of paroxysmal nocturnal hemoglobinuria. Blood. 1993; 82: 1192-6. Devine DV, Siegel RS, Rosse WF. Interactions of the platelets in paroxysmal nocturnal hemoglobinuria with complement. Relationship to defects in the regulation of complement and to platelet survival in vivo. J Clin Invest. 1987; 79: 131-7. Sims PJ, Rollins SA, Wiedmer T. Regulatory control of complement on blood platelets. Modulation of platelet procoagulant responses by a membrane inhibitor of the C5b-9 complex. J Biol Chem. 1989; 264: 19228-35. Zhang J, Piro O, Lu L, et al. Glycosyl phosphatidylinositol anchorage of tissue factor pathway inhibitor. Circulation. 2003; 108: 623-7. Jankowska AM, Szpurka H, Calabro M, et al. 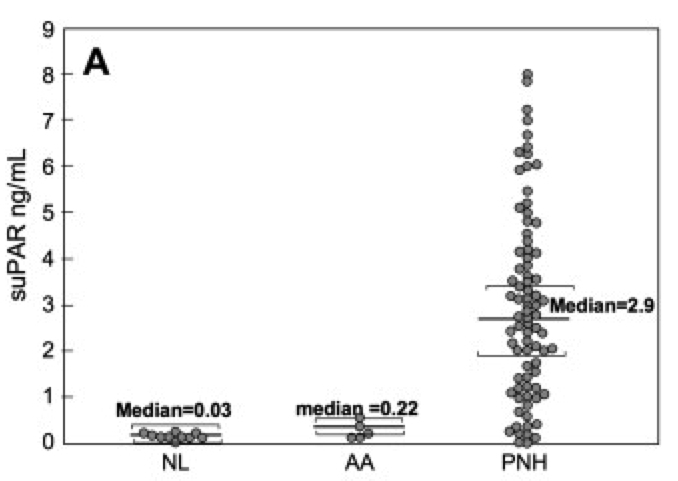 Loss of expression of neutrophil proteinase-3: a factor contributing to thrombotic risk in paroxysmal nocturnal hemoglobinuria. Haematologica. 2011; 96: 954-62. Almeida AM, Murakami Y, Layton DM, et al. Hypomorphic promoter mutation in PIGM causes inherited glycosylphosphatidylinositol deficiency. Nat Med. 2006; 12: 846-51. Van Bijnen ST, et al. Mechanisms and clinical implications of thrombosis in paroxysmal nocturnal hemoglobinuria. J Thromb Haemost. 2012; 10: 1-10. Aharon A, et al. Monocyte-derived microparticles and exosomes induce procoagulant and apoptotic effects on endothelial cells. Thromb Haemost. 2008; 100: 878-85. Simak J, et al. Elevated circulating endothelial membrane microparticles in paroxysmal nocturnal haemoglobinuria. Br J Haematol. 2004; 125: 804-13. Helley D, et al. Evaluation of hemostasis and endothelial function in patients with paroxysmal nocturnal hemoglobinuria receiving eculizumab. Haematologica. 2010; 95: 574-81. Gao Z, et al. Repopulation of liver endothelium by bone-marrow-derived cells. Lancet. 2001; 357(9260): 932-3. Nishimura J, Kanakura Y, Ware RE, et al. Clinical course and flow cytometric analysis of paroxysmal nocturnal hemoglobinuria in the United States and Japan. Medicine (Baltimore). 2004; 83: 193-207. Kumar KS, Malet PF, Rutherford C, et al. Paroxysmal nocturnal hemoglobinuria with no evidence of hemolysis presenting as Budd-Chiari syndrome. Dig Dis Sci. 2000; 45: 2238-9. Hillmen P, Lewis SM, Bessler M, et al. Natural history of paroxysmal nocturnal hemoglobinuria. N Engl J Med. 1995; 333: 1253-8. Socié G, Mary JY, de Gramont A, et al. Paroxysmal nocturnal haemoglobinuria: long-term follow-up and prognostic factors. French Society of Haematology. Lancet. 1996; 348(9027): 573-7.
de Latour RP, Mary JY, Salanoubat C, et al. Paroxysmal nocturnal hemoglobinuria: natural history of disease subcategories. Blood. 2008; 112: 3099-106. 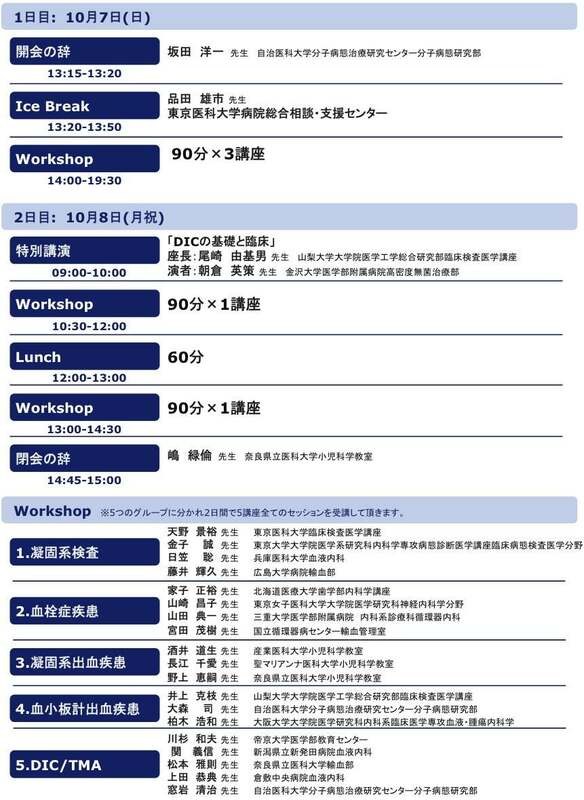 厚生労働科学研究費補助金 難治性疾患克服研究事業. 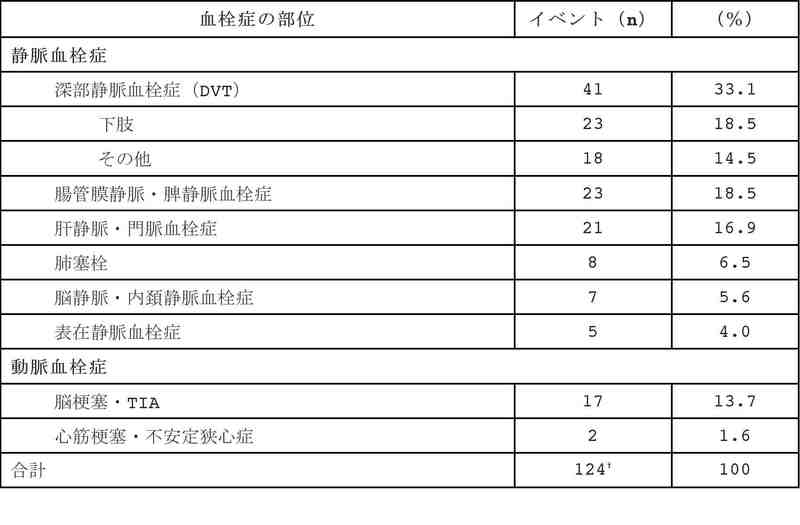 特発性造血障害に関する調査研究班（主任研究者 小峰光博）／PNH の診断基準と診療の参照ガイド作成のためのワーキンググループ. 発作性夜間ヘモグロビン尿症診療の参照ガイド. 2005. Takeda J, Miyata T, Kawagoe K, et al. Deficiency of the GPI anchor caused by a somatic mutation of the PIG-A gene in paroxysmal nocturnal hemoglobinuria. Cell. 1993; 73: 703-11. Parker CJ. Paroxysmal nocturnal hemoglobinuria. Curr Opin Hematol. 2012; 19: 141-8. Röth A, Dührsen U. Treatment of paroxysmal nocturnal hemoglobinuria in the era of eculizumab. Eur J Haematol. 2011; 87: 473-9.